...: how to pick up babes, and make sense of things. how to pick up babes, and make sense of things. 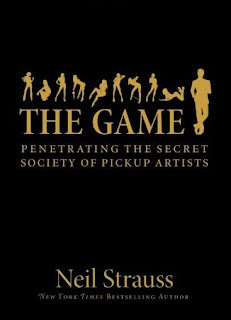 Neil Strauss is an author/journalist/ghostwriter and probably best known for his work in The Game: Penetrating the Secret Society of Pickup Artists. Strauss reports his journey to the seduction community to become a pick-up artist. He also narrates his success with women,the spreading of the seduction community itself and his life at "Project Hollywood", a high end mansion and a lifestyle plan shared by Strauss, Mystery and other members of the Seduction community. I believe there is 'lesson' of sorts at the end of the book that makes the entire thing kind of cute; however, for the most part lets face it- who wouldn't want to learn how to effectively pick up babes? Exactly. Strauss is also a contributing editor at Rolling Stone, and writes regularly for The New York Times- nothing to scoff at. Anyway, a good friend of mine showed me this quote after he read the book (again, babes, who wouldn't?). I kind of love it so I thought I would share. "Usually, what you wish for doesn't fall into your lap; it falls somewhere nearby, and you have to recognize it, stand up, and put in the time and work it takes to get it. This isn't because the universe is cruel. It's because the universe is smart. It has its own cat-string theory and knows we don't appreciate things the fall into our laps." I think it would make for a good "The Way I See It," m.
jon rusk read this and his game actually picked up. even after all of our heckling him for reading it. Over 345 items that you should consider cleaning in your home. 3. She retains a few odd (but seriously helpful!) items in her cleaning kit. When I arrived home, they'd cleaned everything I asked and even more. If you're using a laptop computer or tablet, شركة تنظيف منازل بالرياض try moving it somewhere else and give it another proceed. Or, search near a city, place, or address instead. At first, I thought the cleaning service was great, and arranged an every-other-week service which I continued for about 3-4 months. I own a washing company and easily got wind of my associates behaving that method, they might be fired. We provide a high grade cleaning provider tailored to match your requirements on a Daily, تنظيف الفلل الجديدة Weekly, Once a month bases or simply one-time Washing for Flats, Villas and Penthouses. You are in control of your experience, whether you're hiring cleaners or looking for a client. Anita responded to my text 7 minutes later on to let me know she would check their GPS.. But at that point I was disappointed with the complete procedure.. Why make the client be so comprehensive with confirming شركات تنظيف بالرياض رخيصه and describing the work and responding Master bedroom - one part of the base board was not dusted, nor was one of the windows sills, the shutters were never opened to do any kind of cleaning. I don't care just how much home cleaners make in balance with how much nurses make. This list is merely an example to provide you with a sense of what they can do. You ultimately get to pick what شركة صيانة مسابح بالرياض they do, using your TIDY To Dos. Just to ensure that you realize me Anita: I liked your business and the washing lady you delivered, but I did so not feel just like writing an assessment. Clients want their homes cleaned completely on a constant basis with no complications. You have to watch carefully - the original agreement was that they would use their personal cleaning products and شركة صيانة مكيفات شمال الرياض that all I needed to supply was paper towels. Both businesses and specific cleaners may offer solid bang for your buck; that you choose depends generally on your own preference and comfort and ease.